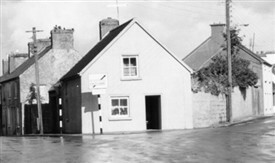 John Joe Rochford's home at the apex of Castlebar Rd and Creagh Road, Ballinrobe. From his house on the Castlebar Road which has its front door positioned in such a way that he can overlook the comings and goings of, as he says himself “half the town”, John Joe Rochford notes the lack of asses and carts in the town as the biggest change since the days of his youth. As a youngster he can remember Bridge Street being full of stationery asses and carts, patiently awaiting the return of the absentee proprietors. 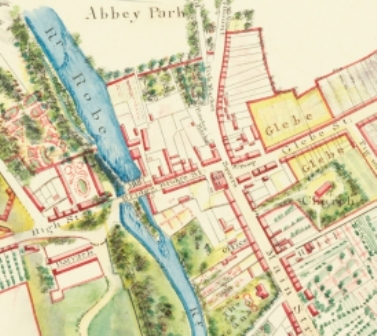 When asked if he has seen Ballinrobe improve since the days of the paraffin oil lamps, he replied to the negative and blames this on the trend whereby any local who built up a business and gave employment, promptly quitted the town to leave the business in incapable hands. He does have great respect for the O’Connor family who built up Western Pride from scratch and have loyally stuck with their business. No discussions with John Joe, who was Bank (Munster & Leinster) porter for 28½ years, would be complete without mention of his first love; Gaelic football. Has it lost its appeal for him? “Has it hell, I enjoy it now more than ever”. The best Ballinrobe player he has ever seen was Atty Gibbons, High Street R.I.P., a brother of Mrs Agnes Gibbons, Abbey Street. Atty won an All-Ireland with Dublin as a center half forward in the early 1920’s and to this day John Joe believes that our local G.A.A. pitch should be named after him, a cause for which John Joe campaigned. Mr. Rochford was a county junior football sub for a spell during his 17 year career (1927-1944) and along with Harry Mellott he holds a Connacht Club Hurling Championship Medal. He vividly recalls how Ballinrobe were often struggling to field a team for a home match but when they were due to play away, 19 or 20 players would suddenly appear, a tribute to the drawing power of beer and crack (sic) away from home. Other heroes of John Joe’s were Paddy (Connie) Jennings, Main Street, Johnny (Snolly) Sheridan, whom he described as the best goalie to ever play between the sticks and of course the great 1934 team on which John Joe played. On Peter Forde, the current May full-back, John Joe remarks that “he is as good a full-back as we ever had”, which is no mean tribute coming from a man who has seen such greats as Paddy Prendergast and Paddy Quinn in action. Possibly the biggest interest of John Joe’s in recent years has been in the local G.A.A. teams and he is still a regular in Flanagan Park, Mc Hale Park and James Stephens Park. However, the mode of transport has changed somewhat since the 1920’s and 1930’s when himself and Jack Langan, Cloonacastle used to cycle to Castlebar to County Board meetings and often only get an hours sleep before rising for work at 8 a.m.
My final question to John Joe who was such a wealth of information that he could fill a book, was to pinpoint why Ballinrobe held such an attraction to him. He replied showing all the cuteness of his years, “a savage loves his native shore”. This page was added by Averil Staunton on 24/04/2012. I think. "Innit" lived right across the road from me and was a suitable and willing interviewee.